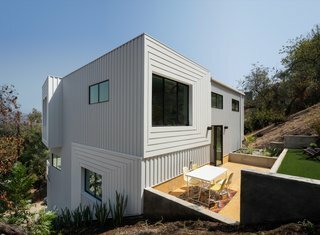 When David Freeland and Brennan Buck of architectural design practice FreelandBuck purchased a roughly 6,000-square-foot hillside property in the Mount Washington neighborhood of Los Angeles, they saw potential where many others would have only seen challenge. 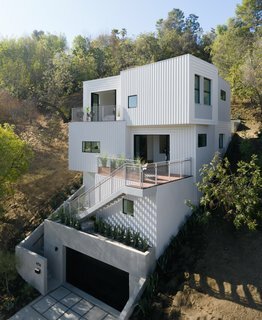 Working together with Marieke Ochtman of real estate development firm Urbanite Homes, the architects turned the steep terrain into the site for their first spec house—dubbed the Stack House—that’s designed to push the envelope in hillside residential design. 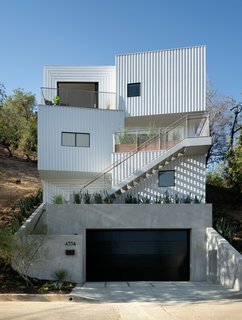 The four-story Stack House is nestled into a hillside in the city's Mount Washington neighborhood. 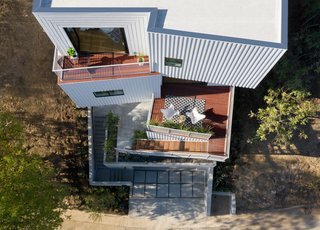 Named after its stacked box appearance, the 2,207-square-foot vertical home navigated the difficult site constraints—including tricky zoning codes and steep terrain—while prioritizing indoor-outdoor living on all four floors. "With each offset, the adjacent roof becomes a balcony, expanding interior spaces to the exterior at every floor," explain the architects. 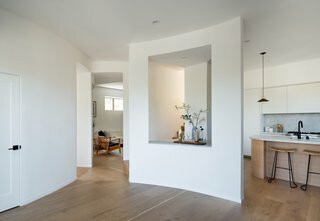 "These indoor-outdoor spaces have varied orientations with unique and unobstructed views to the San Gabriel mountains." 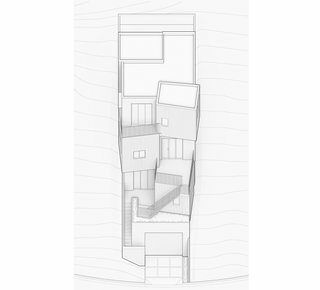 "Unlike conventional hillside homes that appear to have been placed atop the slope, this house is embedded into it, creating a much closer relationship to the landscape," the architects explain. 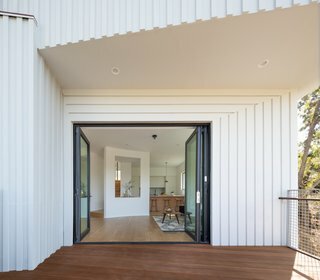 "The exterior cladding of the house is custom-made, a play on board-and-batten siding organized into patterns that suggest varied depth and texture," notes the firm. 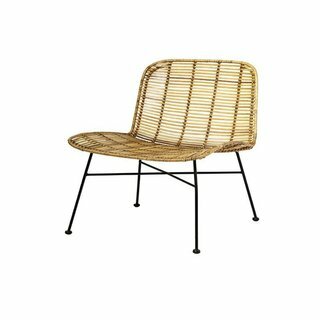 "Painted in subtle gradations from white to gray, the striped shadows of the board-and-battens shift throughout the day. " Smart home features were integrated throughout and include a sprinkler system, Nest control, and tankless water heaters. 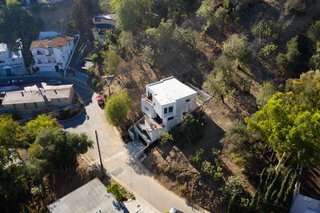 The four-bedroom, three-bath home is divided into a series of boxes, each slightly rotated and shifted to create outdoor spaces and optimize unobstructed views of the San Gabriel Mountains. Folding aluminum-framed glass doors facilitate a seamless transition between indoors and out. 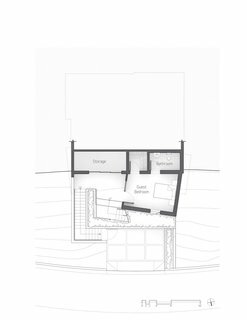 The architects also integrated an accessory dwelling unit (ADU) into the massing and sandwiched the a bedroom suite between the two-car garage on the ground floor and the primary living spaces on the third level. 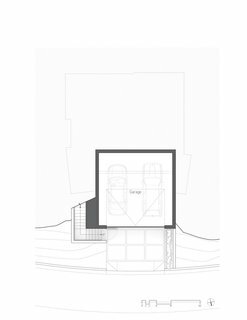 Accessed via a separate entry, the second-level ADU can be used as an office, fourth bedroom, or a suite for a possible tenant. 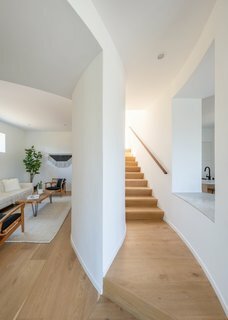 Organized into a simple grid of four rooms, the third floor houses a dining area, kitchen, living room, and den—all defined by curved interior walls. The kitchen is fitted with marble counters and backsplashes, as well as Viking and Bosch appliances. 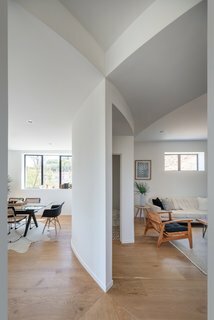 "The central corner of each room is removed, as the rooms are knitted together by a series of tangent arcs," adds the firm. 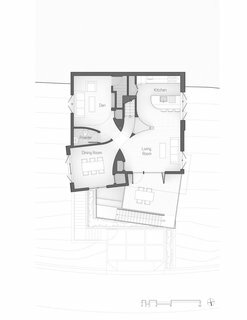 "The curves blend spaces while carefully opening views through the house." A powder room is sandwiched between the dining room and den. 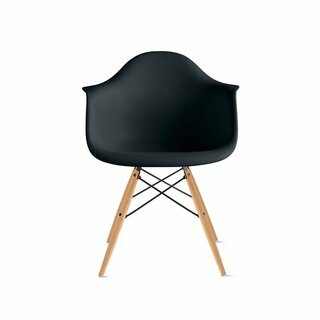 Charles and Ray Eames believed that “design is a method of action,” and they continually updated their work as new materials became available. 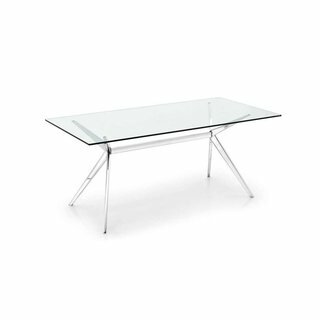 The Seven Dining Table is a classic rectangular glass top table with a modern appeal. It's highly reflective tempered glass top exposes Seven's strong welded steel base. French oak flooring in a natural finish has been used throughout. 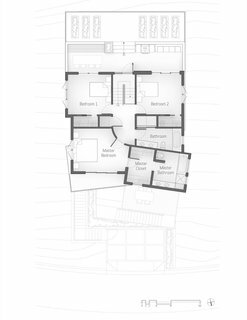 The fourth level comprises a master suite along with two secondary bedrooms, all of which are organized on the same four-square grid as the level below. 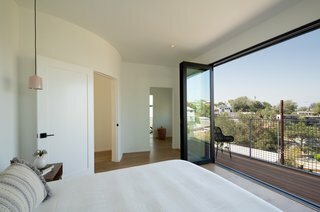 The master suite is located in the front of the home and opens up to a balcony through folding glass doors. Completed in 2018, the bespoke Stack House had been listed for an asking price of $1,399,000 and is currently pending a sale. 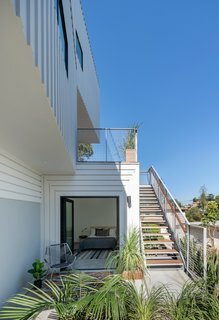 The fourth floor connects to an outdoor dining area and garden space.